Over the next month or so is a wonderful time to spend outdoors enjoying Zion National Park. Daytime temperatures will likely drop into the most pleasant zone, and depending on the elevation you visit, you’ll be there for the start of fall foliage season. Photo courtesy Deborah Wall The North Fork of the Virgin River flows through the main area of Zion National Park in Utah. Photo courtesy Deborah Wall Zion National Park in Utah is an excellent fall destination. You can get double value for your visit if you participate in one of the workshops being offered in outdoor settings by Zion Canyon Field Institute. Besides those workshops listed here, you can arrange custom adventure for yourself or groups through the institute. Oct. 6 and Oct. 20: Archaeological Field Day. 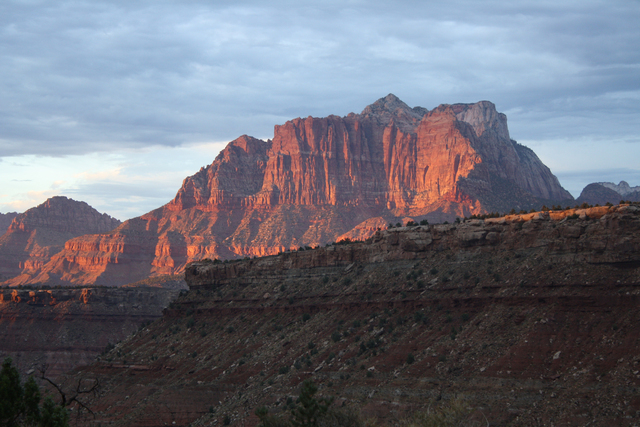 Spend a day with a Zion archaeologist. Participants might do site survey work, cataloging or other archaeologist work. 9 a.m.-4 p.m. Limit of two participants. Ages 16 and up. $60. Oct. 7 and Oct. 22: Rim to Floor or Rim and Back. Join an institute naturalist as you hike either the East Mesa Trail to Observation Point and down into the canyon floor, or the East Rim Trail to Deertrap Mountain and back. 7-8 miles of hiking. Ages 16 and up. $65. Oct. 12: Wednesday Wildlife Walk. Join a biologist and search for wildlife or evidence of wildlife along a scenic hike. Ages 12 and up. $45. Oct. 15: The Ferns of Zion. Join botanist Steve McKee exploring Zion’s east side to see a variety of hidden spots to find ferns and fern allies. Ages 15 and up. $60. Oct. 17: Outside Looking In. Hike the Eagle Crags Trail with a naturalist. Learn about the geology, botany and human history of the park. 5-6 miles of hiking. 8:30-3 p.m. Ages 16 and up. $60. Oct. 20 and Nov. 3: Thursday Trek. Join a naturalist for an introduction to the geology, flora, fauna and cultural history of the park. Hike will be naturalist’s choice. Ages 15 and up. 9 p.m.-2 p.m. $45. Oct. 22: Fall Journaling in Zion. Learn about the natural world in the park by observation and listening to nature. Gain knowledge of the best ways to create journals of your time in Zion or future trips through writing and drawings. Ages 16 and up. $60. Oct. 28: Fall Foliage Photography. This two-day workshop is taught by Michael Plyler, the institute’s director, and is for the serious nature photographer. Learn how to use your camera in full manual mode, photographing the park’s iconic landscapes and its hidden treasures. Two full days, with a 2½ break midday. 9 a.m. till dusk. 16 years and up. $225. Oct. 29: Fall Bird Hike. 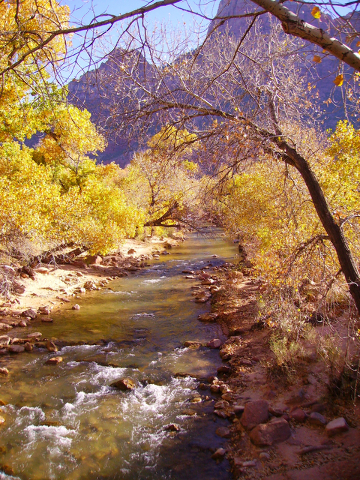 Walk along the Virgin River along the Pa’rus Trail and then to the top of the Watchman Trail for the best birding spots in the park. 9 a.m.-1:30 p.m. 16 years and up. $45. The meeting place for the workshops is at the Zion National Park Human History Museum, just inside the park’s entrance. Since temperatures fluctuate greatly throughout the day and there are different excursions to higher elevations be sure to wear layers of clothing. Reservations for classes and workshops are necessary, and they fill up fast. Contact The Zion Canyon Field Institute at www.zionpark.org, 800-635-3959 or 435-772-3264. Many of Deborah Wall’s columns have been compiled in the book “Base Camp Las Vegas, Hiking the Southwestern States.” She is also the author of “Great Hikes, a Cerca Country Guide” and a co-author of the book “Access For All, Seeing the Southwest With Limited Mobility.” Wall can be reached at Deborabus@aol.com. From Boulder City drive north on U.S. Highway 93/95 and merge right onto Interstate 15 north. Follow for 125 miles to Utah Route 9 (Exit 16 -Hurricane/Zion National Park). Follow Route 9 east for 32 miles to Springdale, Utah, and Zion National Park.